Have you ever had hassle-free cooking experiences? 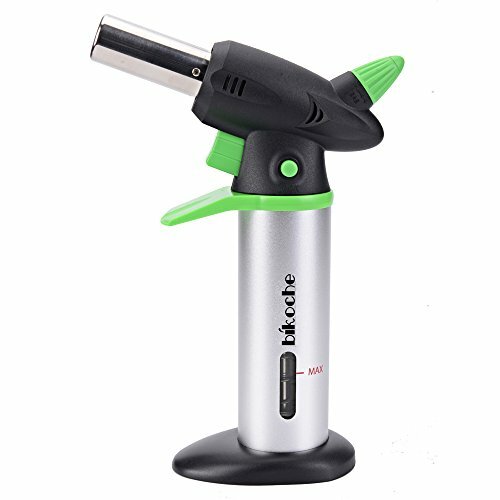 If no, we strongly recommend our professional Culinary Butane Kitchen Blow Torch to you before you are going to give your roasted and baked food a final touch. - Our reliable Anti-Flare technology and Safety Lock design allow you to operate the cooking torch freely. Profession makes make your food tasty. - The operation is handy. After you press the Safety Lock of the crème brulee torch, ignition only needs one simple pull to the trigger. You can close the flame by pressing the Safety Lock again. - Our culinary torch entitles you to caramelize Creme Brulee, glaze hams, toast breads, brown meringues, sear steaks, melt cheeses, grill seafood, even in various party and much more. Newest Piezo Ignition Technology: While pressing the safety lock of the cooking torch, one gentle pull to the trigger will ignite fire. No need battery. This professional crème brulee torch can start fire thousands of times. It will get your simple recipes transformed into dishes that look and taste good as if they come from a professional chef. Extremely Safe and Visible: Security lock design and anti-flare technology prevent you from accidental ignition and assure your cooking safe. Only while you press both the Child Safety Lock and the Trigger of the blow torch, the flame can be ignited. From the fuel gauge window, at any time you will know when butane gas should be refilled. Refillable and Adjustable: You can easily use most butane gas to refill this culinary torch when its gas runs out. The flame intensity temperature can easily be adjusted to reach up to 1300 c/2500 F in order to meet various needs, such as BBQ, glazing ribs, caramelizing food, crème brûlée, melting cheese and lighting cigarette etc. Extremely Easy to Use: You can easily start fire as long as you press the Child Safety Lock and the Trigger button one by one meanwhile. And you can easily adjust the flame size by rotating the Flame Adjustable Knob. You can stop the fire at any time by just one press onto the Child Safety Lock button .This butane culinary torch has a Fuel Gauge Window for gas refilling indication. NO HASSLE WARRANTY: We have confidence in the quality of our cooking torches and we provide NO-Hassle-Money-Back Guarantee for 30 Days. Note: The butane GAS will NOT be INCLUDED when you purchase this kitchen torch. If you have any questions about this product by BIKOCHE, contact us by completing and submitting the form below. If you are looking for a specif part number, please include it with your message.